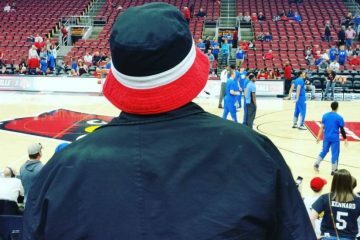 In a sweltering afternoon affair between a pair of ranked programs, the #25 Louisville Cardinals fell to the #19 Indiana Hoosiers in extra innings, 9-3. A 2 run blast in the bottom of the ninth forced extra baseball at 3 runs a piece, but IU would put their foot on the gas in extras. The early innings consisted of a pitcher’s duel, with both teams only registering one base hit a piece through three innings. Freshman southpaw Reid Detmers made his sixth start of the season, solidifying his spot as the midweek starter. He would keep IU off the scoreboard up until the fourth inning when they would plate the game’s first run. However the Cardinal Nine found themselves facing yet another another slow start. 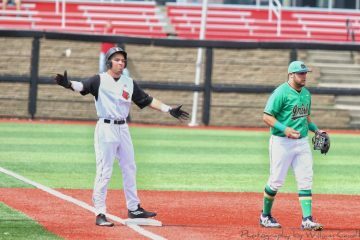 Louisville would go three up, three down in 3 of their first 4 innings at bat, and could only muster 3 hits through the game’s first five innings. Fortunately for Detmers, a base hit off the bat of junior outfielder Josh Stowers with a runner on third would tie up the ball game at 1-1 through six innings. When sophomore Shay Smiddy would relieve Detmers in the seventh, the 1-1 tie would only last for an inning. 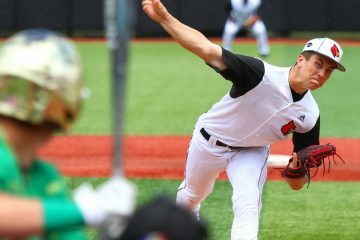 Indiana would break the scoreless tie in the eighth and force Louisville to go back to the bullpen, bringing in fireballing sophomore Michael McAvene. The right-hander would be unable to keep IU off the scoreboard as well, with the Hoosiers plating themselves an insurance run in the top of the ninth. Leading off the bottom of the ninth with your 7-8-9 batters while playing from behind aren’t typically what a manager wants, but today it didn’t matter. After leading off the inning with a base hit from freshman Lucas Dunn, Coach Mac decided to yank catcher junior catcher Pat Rumoro and sent sophomore outfielder Ethan Stringer in to pinch hit. On a 1-0 count, Stringer absolutely launched a ball onto the berm for his 3rd home run of the year, tying the game at 3-3. The Cards wouldn’t generate any more offense after the two run bomb, so into extra innings it went for the first time all season. IU wasted little time though, plating six runs including a 3 run home run and forcing Louisville to use 3 pitchers in the the 10th inning alone. 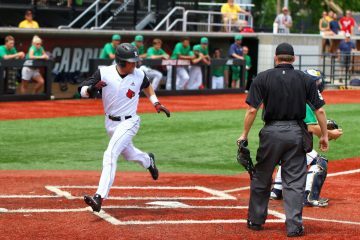 Sophomore designated hitter Danny Oriente gave Louisville a fighting chance with a 2 run blast in the bottom of the tenth for his first home run of the season, but the no one else would generate any more runs and the extra innings contest would end with a 4 run loss.